Kevin Durant was named Finals MVP for the NBA. 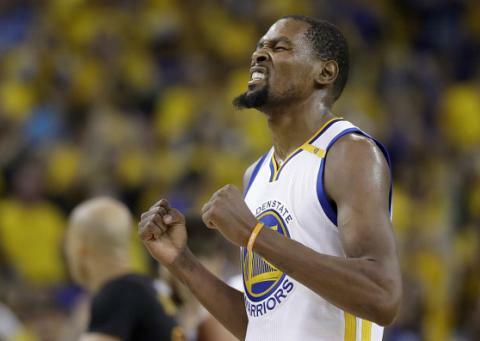 OAKLAND—The Golden State Warriors captured their second NBA Title in 3 years in front of their loyal fans at Oracle Arena, defeating the Cleveland Cavaliers, 129-120 on Monday, June 12. Kevin Durant earned Finals MVP, leading DUB Nation with 39 points on 14 of 20 shooting from the field. Durant was spectacular over the five games of the series, scoring at least 30 points in every single game, while averaging 35.2 points, 8.4 rebounds, 5.4 assists, and 1.6 blocks. One year after their infamous Finals collapse, this “Superteam,” is poised to be the next great NBA dynasty with no end in sight. The Warriors finished off the Playoffs with an outstanding 16-1 mark, an NBA record. Furthermore, these Warriors found redemption, and didnt squander this 3-1 edge. Steph Curry bounced back from a dreadful Game 4, to torch the Cavs for 34 points and 10 assists. Durant weathered the criticism ever since his shocking announcement to join Golden State on July 4, 2016. Andre Iguodala added 20 points off the bench, the Warriors outscored the Cavs bench, 35-7. This is the organizations fifth NBA Title. The Cavaliers weren’t going down without a fight. Jumping out to an early 41-33 lead, prior to the Warriors erupting for a 17-point free for all. The Cavaliers cut the lead to 5 points in the fourth quarter, but never got any closer. LeBron James led all scorers with 41 points, to go along with 13 rebounds and 8 assists. The King falls to 3-5 in his NBA Finals career, yet he couldn’t have done any more. Averaging a triple double with 33.5 PPG, 10.5 rebounds and 10 assists. Kyrie Irving scored 26 points, but the depth is lacking for the Cavs. J.R. Smith scored 25 points, but no one else, certainly not Kevin Love showed up. The Cavaliers will be forced to retool this summer, difficult changes must be made. Is this the greatest NBA team ever? Time will tell, but tonight is about vindication, and relief for a squad that proudly hoisted the Larry O’Brien Title, after the agony these Warriors endured last season.